Shadow is part of literacy campaign in Portland Public Schools! We are so excited to be part of the Portland Public Schools literacy campaign. 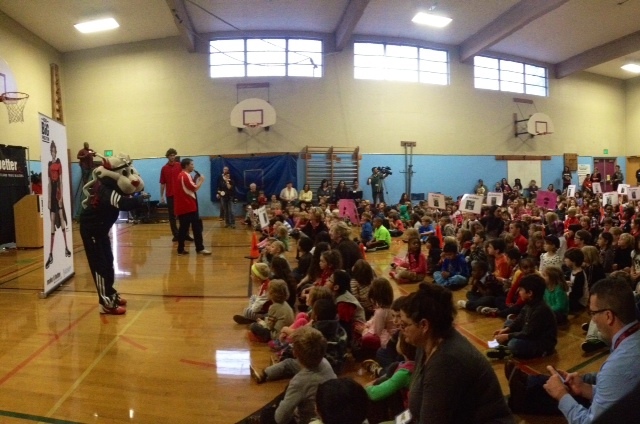 On Wednesday, November 6, the literacy campaign “READ BIG” was kicked off by the Portland Trail Blazers! We have been working closely with PPS and our other partners Reading Results, SMART – Start Making A Reader Today, Multnomah County Library, The Children’s Book Bank, and SUN Schools, on this collaborative pilot project which will support the district’s efforts to have every child reading to learn by 3rd grade! That was, indeed, a seven-foot Trail Blazer hanging out at the Chief Joseph campus yesterday. Blazers center Robin Lopez stopped by the North Portland building to help kick off the “READ BIG” campaign, an effort to get all first graders to literacy by third grade. The campaign is co-sponsored by the district, the Blazers and Knowledge Universe, an early childhood education provider. The efforts also include other Multnomah County districts. Jon Isaacs, senior policy advisor for PPS Superintendent Carole Smith, said the goal of getting students to read on grade level by third grade is a milestone well-known in the education community, but not to the general public. The campaign will generate awareness of its importance and let everyone know how they can help, he said. 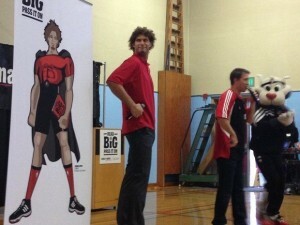 Lopez on Wednesday was accompanied by a life-sized animated superhero rendering of himself. Lopez, who spent two years at Stanford University before entering the NBA draft, told students he credits his mother with instilling a love of reading into his early life. The effort includes a city-wide book collecting campaign, classroom posters, reading logs and a public service campaign. Kids in select elementary school classrooms will also be enticed to meet reading goals with several Blazer-related rewards, including special classroom visits, basketball tickets and a reading celebration with the team at the Moda Center in March. It may seem obvious for schools to encourage literacy but mastering the skill by third grade truly has big implications for students. Research has shown that a student who can read on grade level by third grade is four times more likely to graduate than a student who can’t. The statistics get even bleaker for low-income students who can’t read at that time. In Portland Public Schools, about 74 percent of third graders were reading at grade level, according to the latest state test results. That’s a very slight dip from the year before. The efforts include a lot of partners: Reading Results, SMART Readers, the Shadow Project, the Multnomah County Library, SUN Schools and the Children’s Book Bank are all getting in on the act. Earlier this fall, the book bank was involved in the Children’s Fall Book Harvest with the goal of collecting 25,000 books. You can find out more information on Portland Public Schools and its involvement in the campaign on the district website.